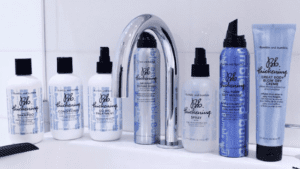 Bumble and Bumble’s Thickening Collection has Gone Big. With two new products, some reformulation and some regulars you can count on, like Dry Spun, Thickening is moveable, touchable lasting volume and no old school crunch. Thickening Great Body Blow Dry Creme (New), Heat-protective creme moisturizes, volumizes and holds blow dries. Thickening Go Big Treatment (New), This treatment moisturizes and thickens. Thickening Volume Shampoo, The gentle cleanser pumps up volume while adding moisture. Thickening Spray, As a prestyler, this spray helps prepare hair for blow dries. Thickening Creme Contour, The shaping creme melts into palms for soft texture that works to create contours and shapes.